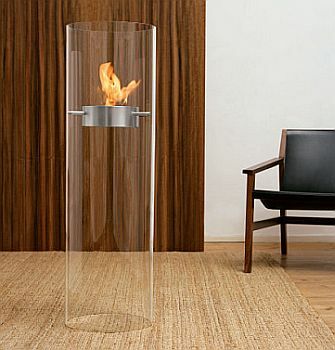 Geniol Fireplace Edition, For Your Indoor Moodsetting Needs | OhGizmo! By David Ponce on 10/30/06 • Leave a comment! What many of you don’t realize is that OhGizmo headquarters consist of a one bedroom apartment the size of half a shoe. While definately cozy, it leaves little room for the finer things in life, like a fireplace. And everyone knows that it’s impossible to impress a lady without a fireplace and a fur rug (preferably zebra or tiger). So we’re thinking that maybe, if we buy what looks like the next best thing, we could be on our way. It’s the Geniol Fireplace Edition, and can be used indoor or out. It doesn’t require a chimney and burns standard fuel paste, which is bought separately. The centerpiece is made from stainless steel and attached to the sides of the glass cylinder with screws but gives the impression of floating in the air. Of course, if we can’t afford to live in a place that has a fireplace, chances are we won’t be able to afford the $1,800 or so that this thing costs. That’s a lot of change for a big glass tube and a bit of metal.